What Are the Causes of Household Mould? Depending on where you live, your house many become extra susceptible to water damage as the seasons begin to change. During autumn, rain can seep in through cracks in the roof or the foundation of your home and cause flooding. After winter, melted snow can also cause flooding and water damage. Both of these situations are very frustrating to deal with as a homeowner, but there are other consequences of water damage that make things worse. If you have signs of mould in your house, it could mean that you have had water damage problems for a while but did not notice until the mould began to appear. There are many causes of mould in your house and completing mould removal as soon as possible is the best way to protect your property. Here are some common causes of mould, and how you can get quick and effective water damage repair and cleanup to prevent it. Without proper ventilation in your home, pockets of stagnant moisture can remain, causing mould to grow. Steam and water that evaporates into the air creates the perfect breeding ground for mould. Opening windows to allow fresh air in to dry these areas is a great way to prevent moisture from building up, and to keep the moisture levels balanced. If it is humid outdoors, consider buying a dehumidifier and placing it near rooms that tend to have higher levels of humidity. Humid weather for a few days in a row is one of the main causes of mould on walls, corners, window sills, and other areas of the home. Wet air is a breeding ground for mould, and if your home is not well ventilated, you may experience recurrent mould growth. If you typically dry your clothes indoors, on clothes lines, or on stands, it can increase indoor humidity. Your household HVAC system can also create humidity. If your home has been affected by flooding, it’s almost inevitable that you will notice mould growth. Mould loves dark, wet spaces, so under carpets, behind drywall, and other dark, moist areas in your home can be affected. Getting your home professionally dried and cleaned after a flood is the best way to make sure the water damage to your home does not turn into something worse. If you notice mould on walls, ceiling, pipes, or window sills, seek immediate water damage restoration in Toronto. Water leaking from pipes is another common cause of mould growth. The worst leaks are those that have not been detected for days, or weeks, because they are hidden from view. By the time leaky pipes in walls, or other hidden areas are discovered, the mould growth has already begun to grow and spread. You may be quick to notice roof leakage, as it will leave a wet, discoloured mark on the ceiling. But sometimes, like with leaky pipes, the water may not be discovered until mould has already grown. The best preventative plan to control mould growth and spread is to regularly check the attic for leaks and keep an eye on the ceiling. Cold surfaces that get wet by steam or warm water can create condensation. Condensation collects on cold window sills, metal pipes, and concrete floors, even if they are covered with carpet. Places like these are prime spots for mould growth. Cold, dark spaces like the basement, which are not well ventilated, often contain higher amounts of moisture or humidity than other rooms. Condensation can quickly build in these areas to produce mould. If there are any water leaks or floods on the upper levels of your home, this water can drip or seep down into your basement. Different types of mould can grow in your home. 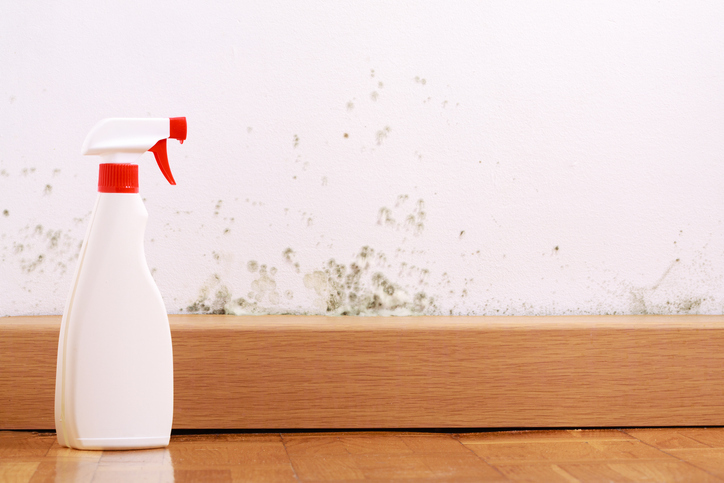 Mould can start to grow on food, but it can also eat organic substances like the wood in your walls, cabinets, or subfloor. A frustrating fact about mould is that it spreads through the air. Hundreds of types of mould in the environment can come in through your windows, open door, shoes, clothing, or other items. When these spores settle onto the right surface, they can grow and spread. Flood waters and leaks can also bring in mould spores. To prevent outside mould from coming into your home, keep your windows closed when the humidity is high, and make sure you do not leave any wet clothes or standing water lying around for which mould can make a home. If you notice water damage or mould growth in your home, it can be easy to panic and want to try cleaning it yourself. However, to ensure that all the water has been dried out of every crack and corner, you will need the help of a professional team. Trying to clean up mould on your own may sound like the most cost-effective solution, but since moisture can seep under carpets and behind drywall, there are areas you won’t be able to reach. Professionals have the right experience and equipment to target all of the possibly-affected areas to get your home back to a safe, healthy, mould-free environment. If you need quick mould detection and removal, Flood Services Canada can help you. Our professionals offer a variety of services and solutions to problems related to water damage, and we can help you settle with your insurance company to get your life back to normal as soon as possible. We deploy our quick-response teams to cities across the Greater Toronto Area to help homeowners save their home in emergency situations. We provide 24/7 sewage, water damage, and flood cleanup services and will use the best techniques, personnel, and equipment to ensure your home is clean, safe, and dry as soon as possible. Contact us at (416) 302-2107 to learn more about our services, or use our emergency hotline at (416) 999-3930 to get our rapid-response teams deployed to your location.